I met Jim Power during the search for the diary of Maj. Thomas B. Webber of the Second Kentucky Cavalry. Webber's story from Mississippi postmaster to one of Gen. John Hunt Morgan's trusted subordinates is one of the more dramatic transformations in my book, Faces of the Confederacy. Jim's generosity and helpfulness was invaluable, particularly his sharing of the Webber diary he painstakingly transcribed. Jim dedicates an entire volume to Webber, a worthy biographical subject largely unknown today. The "Iron Man" and the "Mississippi Company" of Morgan's Raiders is available now from AuthorHouse. 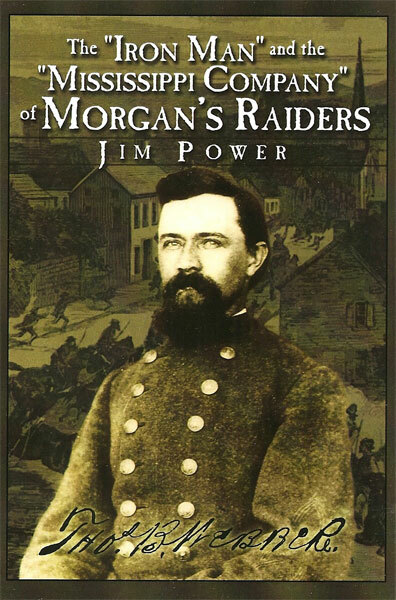 From the book description: The "Iron Man" and the "Mississippi Company" of Morgan's Raiders tells of a company that joined John Hunt Morgan's Kentucky cavalry and participated in the "Great Raid" into Indiana and Ohio where most of the company was captured. Their leader, who due to health problems appeared to be a wimp from his 1861 diary, had to be helped to mount his horse, but his leadership gained him the title of "Iron Man" from his troops. After prison some of the troops were in Jefferson Davis' guard as he attempted to escape. The closing chapter tells more about the men and the hard life to which they returned. The book contains unpublished material and portrays southern life in the 1860s. I can't wait to receive my copy.